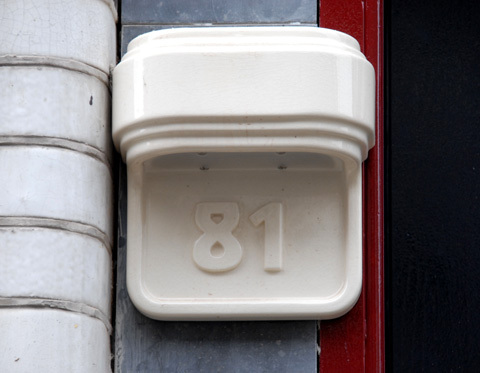 On the Eerste Jan Steenstraat, in the Amsterdam neighbourhood of De Pijp, a group of houses has been renovated with their house numbers set in ornamental ceramic plates. We are gratified that, once again, our ‘Brugletter’ revival, Kurversbrug is being used in such a prominent position, and hope to see more of these plates in the streets of Amsterdam. Keeping alive Amsterdam’s best examples of letter-making tradition is one of our objectives, so we love to discover that architects are making good use of our fonts.